1. While mowing a level lawn, Bill applies a force of 20 N directed at an angle of 60 degrees below the horizontal. How much work does he do pushing the mower a distance of 10 m? 2. A spring with a spring constant of 100 N/m is compressed a distance of 0.1 m horizontally. When the spring is released it pushes a 0.25 kg mass that was initially at rest against the spring. What is the maximum speed attained by the mass? 3. How much energy does a 100W light bulb consumer in an hour? 6. A ball that has a mass m is thrown from a height h with an initial speed v0 at an initial angle θ. Which of the following expressions give the speed, v, at which the ball will strike the ground? 7. Imagine a conservative force with the force law F = aqz. The variables a, q, and z have no particular meaning here, but assume their product has units of force. Which expression might give the associated potential energy? 8. Two cars collide in a low-speed collision in an intersection. After the collision, the two bumpers are locked to that the cars are stuck together. Which of the following statements is true about this collision? a. Momentum is conserved, but kinetic energy is not. b. Kinetic energy is conserved, but momentum is not. 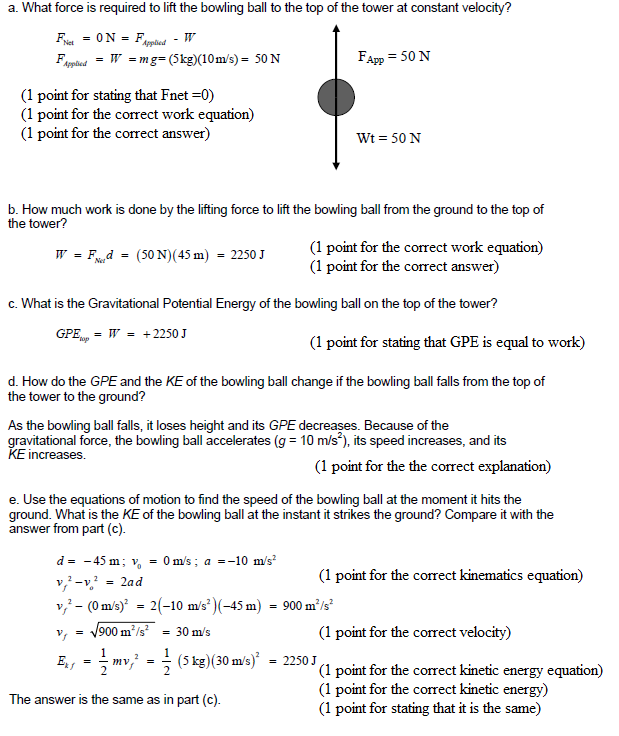 c. Both momentum and kinetic energy are conserved. d. Neither momentum nor kinetic energy is conserved. e. It is impossible to tell what might be conserved without knowing the masses and velocities of the vehicles. 9. A roller coaster at a theme park is traveling at an speed of 20 m/s just before it starts up a hill. If the roller coaster barely makes it over the hill, which of the following is closest to the maximum possible height of the hill? 10. A person with a mass of 80 kg runs up a flight of stairs in 4 seconds. If the elevation gain is 4 m, what is the power of the person expends against gravity? This question requires you to understand the distinction between work and power. First, work or energy is measured in joules; power is measured in watts, which are joules per second. Thus, you should immediately eliminate B and D because neither of them is in the right units. Power is work divided by time P = W / t. the power consumption of a 100-watt light bulb is 100 W, and an hour is 3600 seconds. Multiply the power by the time to get the total energy consumed. This question applies the work energy theorem. Read very carefully; the question specifies net work. The word “net” tells you that the work energy theorem applies in this case. The net work is equal to the change in kinetic energy. Notice that during this part of the elevator’s ascent, it is moving at a constant velocity. This means that kinetic energy doesn’t change. So the net work is 0J. To solve the problem simpler way, apply the law of conservation of energy at the starts of its flight, the ball has potential energy. At the end, this extra potential energy has been converted to even more kinetic energy, increasing the speed of the ball. 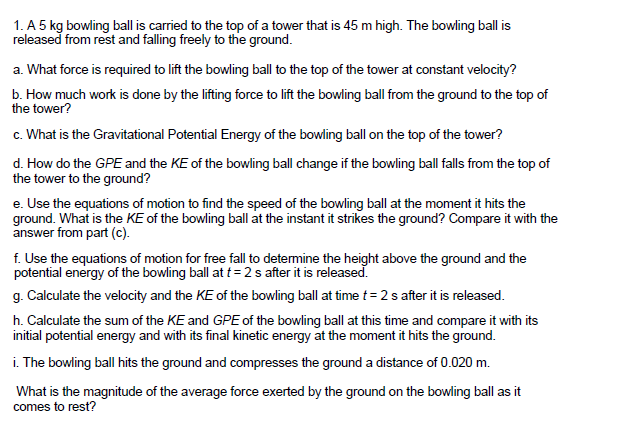 This question requires you to understand the relationship between force and work done, or potential energy. W = Fd. Since F is measured aqz, d is distance, W = aqzx, where x is a distance. If two cars are locked together, then they must be travelling at the same speed. Therefore, it cannot be an elastic collision, where the difference in speed before and after collision is the same. In an inelastic collision, kinetic energy is not conserved. Recall that no matter what, momentum is conserved. 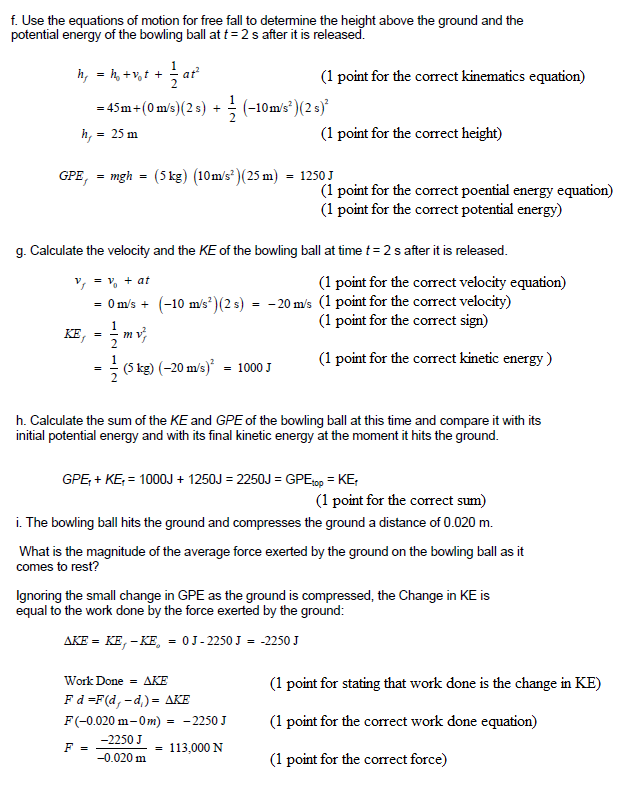 Therefore, only option A is correct, momentum conserved, kinetic energy not. Apply conservation of energy to answer this question. = (20 m / s) ^ 2 / (2 * 10 m / s / s) = 20 m.